We don’t use auto responders, real trained professional will contact you in no more than 24 hours during workdays. Area of our expertise is writing customized software for streamlining workflow. We are capable of making plug-in's or applications for exchanging data between various software packages (Scala, Adobe, Corel, Sony Vegas, Avid, Microsoft SharePoint...) or for batch processing tasks that would otherwise require significant amount of human work. 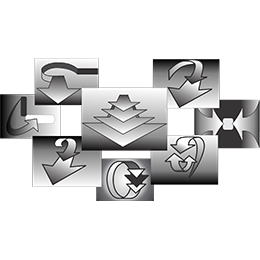 Our automation plugins more often than not, become a part of standard distribution for various software products. But that do not means that we only make large, complex expensive tools. We also make plugins for small design studios, printing studios even independent artists. Affordable even to One-Man Shop! You will be surprised that lots of tools we provide or make are actually free for end users. We have made many of them at Photoshop user’s requests, and there is a great chance that we already have something for you, or that we can adapt existing tool to solve your problem. Those tools we are giving for free. We charge fee usually for complex tools that require support during exploitation. Often as you work in Photoshop there is a repetitive task that you are unable to automate for various reasons, and yet you have to do it over and over again. Maybe you encounter file format that you cannot import or save in Photoshop. Or you have to select part of image and it looks simple but you cannot do it easily in Photoshop. Our experience there come into place and allow us to make custom tools very fast and very affordable. Do not hesitate to contact us. We will do our best to find right solution for you. If you have transition in mind, or you have seen one but you can't find it in Scala Designer, contact us. Beside ones that we offer, the ones that we have made for Scala, we have also made hundreds custom ones for Scala designers just like you.